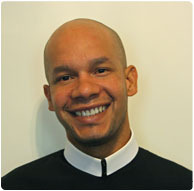 Elton Letang, C.Ss.R., 37, will be ordained a deacon on October 24 in Trinidad. Originally from the Caribbean nation of Dominica, Elton completed his theology studies last spring at Boston College’s School of Theology and Ministry, and began his pastoral assignment this fall at St. Theresa’s in Barataria, Trinidad & Tobago. He professed his final vows with the Redemptorists in August. Click to view photos from the ordination. One of 10 children, Elton was born in the Giraudel area of Dominica outside of the capital of Roseau. His home was a short walk from the Redemptorists’ Holy Redeemer Retreat House in Eggleston. “I was born into a Redemptorist parish, so I have known them practically as long as I’ve known myself,” Elton said. His vocation grew as teachers, friends, and even the students he taught over the course of 12 years, encouraged him to consider the choice for the priesthood and religious life. “My high school was run by the Christian Brothers, and I was invited to vocations weekend and attended a few. A major traffic accident I had in the summer 2002 was the turning point in my life. That, and a retreat for single young adult Catholics, helped me decide to “try out” the religious life,” Elton said. Elton joins another Redemptorist from the Caribbean, Alistair Elias, who was ordained to the diaconate on October 6 in Boston. Both men anticipate ordination to the priesthood in 2013.